The Thomas and Friends magazine attempts to capture this interest with its colorful and fun filled pages. For many years now, these magazines have been published. For so many years now, kids all over the world have loved Thomas the Tank Engine and his friends, known as Thomas and Friends. 3 to 6 year old kids have laughed, clapped and enjoyed their little train adventures and have learnt a lot. 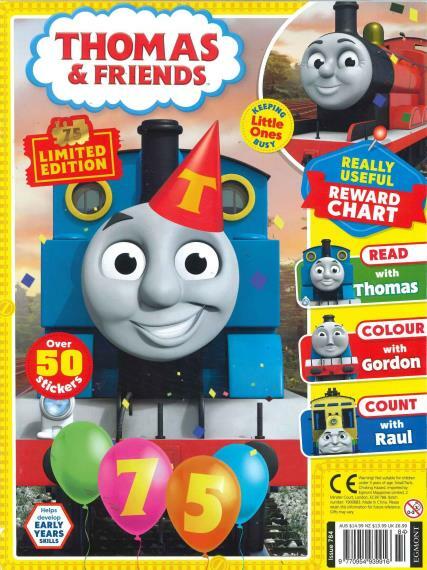 The Thomas and Friends magazine attempts to capture this interest with its colorful and fun filled pages. For many years now, these magazines have been published. Some kids managed to maintain their collection, others were not able to trace them again, some lucky ones are collectors of this prized collection that reminds them of their childhood. The whole cast of Thomas and Friends appear in this fun filled print version. Sidney the Little Blue Engine, Victor the Old Engine, Angus the Fire Engine, No.13 the Unlucky Engine, Little Barford the little engine, The White Van, The Naughty Pink Truck, The Animal Sanctuary Coach and Bennet and Co. Truck and all the other little friends come together to celebrate friendship. Rhymes, stories, puzzles, coloring and other activity corners make the read interesting for the children. This is the perfect activity book for 3 to 6 year olds, who can completely understand and relate the magazine to the television series. Learn facts and trivia about train and enjoy while learning. My little girl loves thomas and friends.. she is always excied when I always buy the book. My son loves the colouring in and activities, helps to reinforce learning of colours and shapes etc. Thoroughly enjoyed by my grandson who loves to do lots of drawing and enjoys the attached gifts.